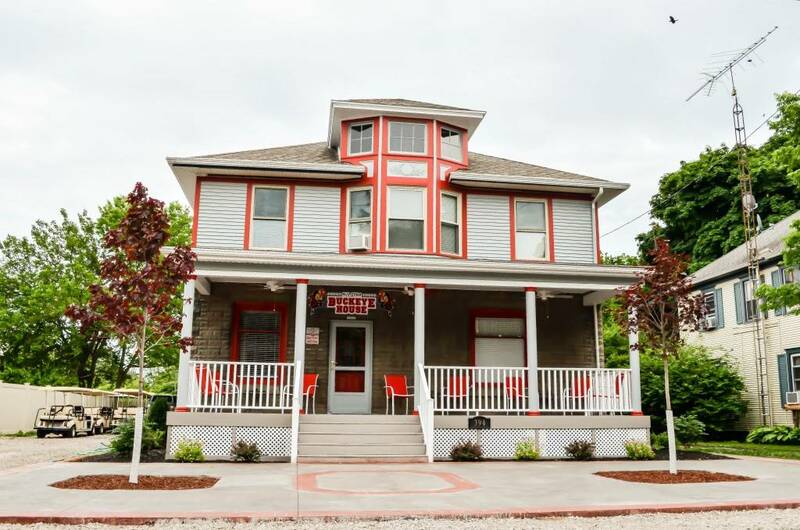 Spacious new Put-in-Bay Victorian rental home remodeled over the winter a few years ago! With 5 separated bedrooms and 3 full baths, this is an ‘open-feel’ home. Large master suite with sitting area offers a queen bed and a unique oversize private bath with tub and shower, enclosed for privacy, of course. Add four more bedrooms, each with queen size beds, and able to rented separately for a total of 22 people. Sheets, towels and linens are provided for all rooms. This Ohio Sports themed home features extra seating in living room to watch the big game on a 60″ TV. Home includes free cable/sat with Wifi available. Front of home courtyard area has beautiful mosaic concrete pad with some Put-in-Bay lake view down through the park. Only 200 feet away from the main strip! Screened in front porch and large front and rear decks accommodate your leisure time. Gas BBQ and corn hole in private backyard. Parking available. Centrally located with full VIP access to the Put-in-Bay Resort and the island’s most popular swim up bar and world’s largest Jacuzzi. The All-Star Ohio House has its own website located at http://www.allstarohiohouseputinbay.com/ but you can also call them at 1-888-742-7829.